This is an updated Super Fly version of the Whitlock Waker Shad. 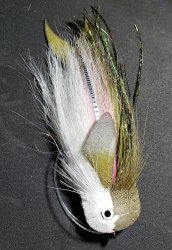 This fly rests on its side on a pause, then keels and shoots around like a dying baitfish on the strip. Vary your retrieve and use that rod tip to bring this great fly to life. These flies are tied with duel weed guards.